Homemade pizza? Check. No long wait? Check. No oven? Check! The quick and dirty route to delicious, crispy thin-crust pizza; just grab a flatbread and do it stove-top! I was hovering over the prepackaged “fresh” mozzarella (the stuff stored in whey and traditionally made from buffalo milk) and was approached by a gentleman who works behind the cheese/olive counter. He smoothly said, “I can see you like mozzarella, but have you tried mine?” Honey, you had me at “mozzarella.” He went on to reveal he had finished making it that very morning, and let me tell you- it’s fantastic. I’m sure y’all could get more creative than I did, but you can’t go wrong with a classic made simple. 1. Heat pan over medium heat. Add olive oil and lay flatbread in pan, face down. 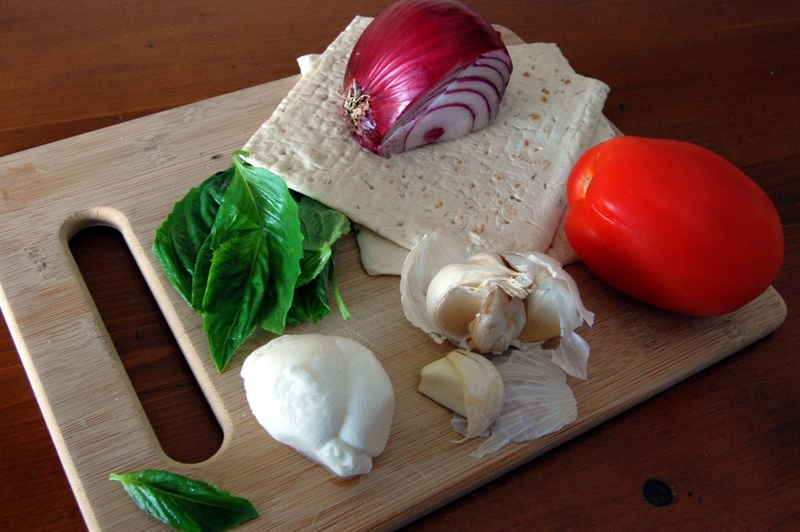 Allow to crisp slightly for 1-2 minutes, but do not allow to brown (the flatbread will continue to cook once flipped). 2. 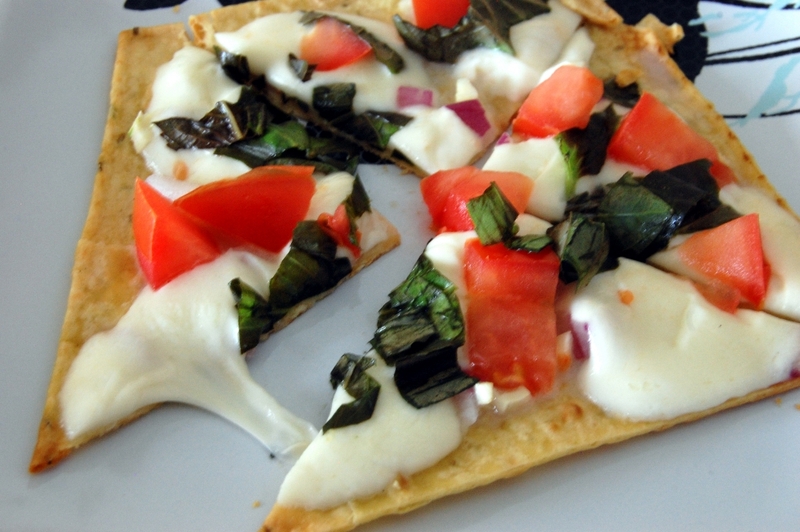 Flip flatbread. The top should be slightly oiled from being face down in the pan. If it is not, drizzle a tiny amount of oil over the top of the flat bread. 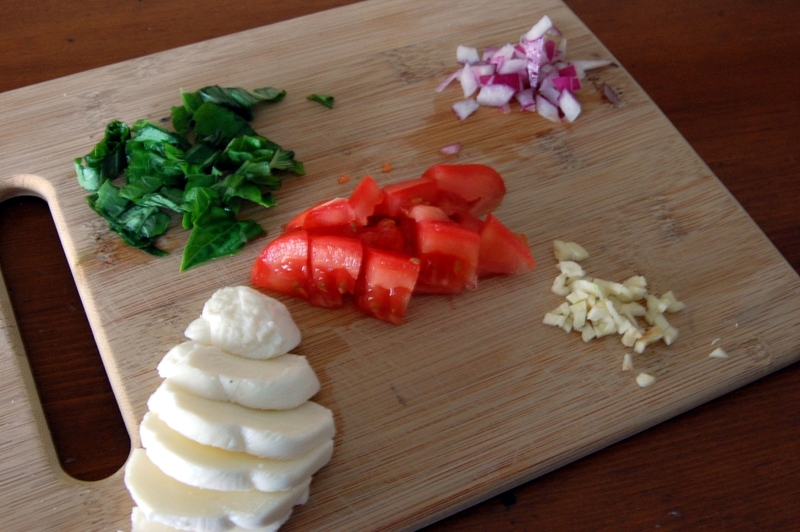 Add onion and garlic, then mozzarella, and finish with tomatoes and basil. Cover and continue to cook approximately 2-3 minutes until bottom is crispy and the cheese has melted. Serve immediately. 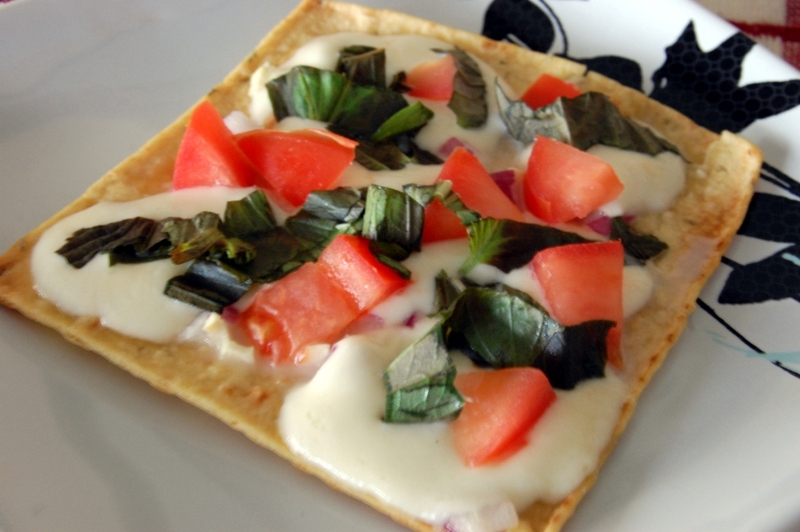 This entry was posted in Appetizers, Dinner, Snack, Vegetarian and tagged Basil, Cheese, Cook Time, Cooking, Easy, Flatbread, Garlic, Ingredients, Mozzarella, Onion, Pizza, Prep Time, Quick, Recipe, Simple, Stove Top, Tomato, Yield by Lazy Suzan. Bookmark the permalink. Just last Friday, I made a similar pizza using naan but I baked it. I never thought of using a pan. That makes it so much easier — and quicker. Thanks for the tip! No problem! I hate having to heat up my oven (and, consequently, my whole condo) for a simple little recipe, so I love the stove top stuff. Thanks for stopping by! This… is gorgeous. And look so good, I love everything about this recipe! I make stovetop pizza fairly often but I always use a pizza dough in a covered saute pan. This is even better! Great idea. Simple ingredients that you have around the house. And fast! Love your recipes, but do you have a printer friendly format without all the pictures? They are beautiful pictures, but use a lot of color ink! Thanks, and God Bless. Hi Wanda! I’ve added a link to a printer friendly version near the bottom of the post where the recipe instructions are. Please let me know if it works for you. I will work on adding a printer friendly version to all my posts!